It’s easy to get carried away playing online slots. The thrill of hitting a big bonus round is exhilarating. Winning a big progressive jackpot could change your life forever. When you feel like you’re getting close to a big win, it’s tough to stop! In situations like these, it’s important to have a slots bankroll management strategy in place to make sure you have enough money left to play another day. Use the following tips to make sure you have fun playing at the slots and maximize your chances of winning. 1) Know your limits. This tip may seem obvious to some, but like was said above, it can be difficult to cut yourself off if you’re having a good time. Before you sit down to start playing, know how much you are willing to lose in that session. Now write this amount down on a sticky note and put it on your monitor. This will serve as a good visual reminder of your limit for the session. 2) Know where you stand. Most online casino slots hit around 50% of the time. Keeping this in mind, if you feel like you are going on long streaks without winning, it may be time to change machines. A good rule of thumb is if you go 6 spins without winning anything, try a different machine. 3) Know how to play your winnings. If you hit a good series of spins that wins you a lot of money, celebrate! After the celebration is over, be carefull; with those winnings. It is best to stop playing right away and keep your winnings. However, if you feel like the machine is hot and will keep paying you well, cap yourself at spending only 25% of your winnings on more spins. This way, you give yourself a good chance to hit another big bonus round without losing all of your winnings. 4) Know when to move on. We all have our favorite machines, but it is never a good idea to let one game completely clean you out for the day. If you are getting close to spending the limit you set for yourself, go ahead and switch machines for a new run of luck. If you follow the rules above you will be sure to always keep some money in your pocket so you have the best chance of hitting that big jackpot. 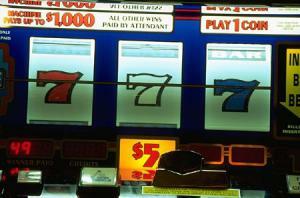 If you are looking for more online slots tips, check out this article about maximizing online slots odds. What strategies do you use to manage your online slots bankroll? Let us know in the comment section below!